I tend to spend most of my time on bottom-up analysis and valuation, but Old School Value online makes it easier to take a top-down approach to narrow down sectors and areas that are either most undervalued or showing the most promise. 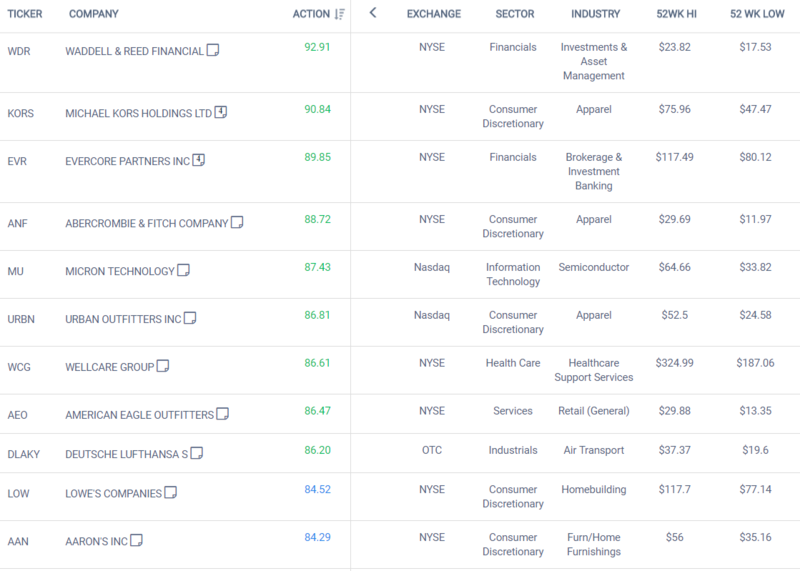 The past few months, a common theme I’m seeing is that consumer discretionary, financials, retail and healthcare are dominating a lot of screens and watchlists I have set up. Here’s a look at my results for a basic screen I have set up to look for high Action Score with high Growth scores. Here’s another list of monthly stock ideas that I track to see which sectors are considered value. The list is a live investment strategy created by University of Michigan. To double check that I’m not making things up, I like to look at profit margins of sectors. The charts below depict the forecasted vs actual profit margins. Healthcare looks to be the most undervalued. Maybe why they haven’t been affected with the recent corrections. Profit margins are either on par or strong, so I’m not staring at obvious value trap sectors. Another measure that I check now and again is Tobin’s Q which measures the value of the market to the replacement value. If a company has assets worth $100 and the market value is also $100, then the ratio is 1. Officially, if the ratio is above 1, then it’s considered “expensive”, but I don’t agree with this definition as it’s simply stating the business is worth nothing in the future. It’s not a realistic on-going valuation model. However, the way I use it is to look at the chart as a whole. To compare the different recession and bull markets and see where we are at. The first link in the nugget fest below goes into greater detail of the market in relation to Tobin’s Q.